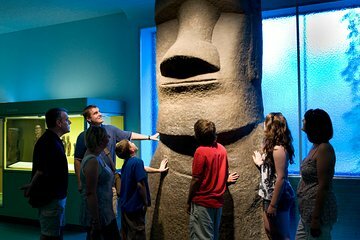 Beat the crowds at the popular American Museum of Natural History with this 75-minute small group tour that takes place before opening hours. Your dedicated museum trained guide will show you the highlights of the Museum. Remain in the Museum after it opens with your timed ticket to the Hayden Planetarium Space Show. Check out the world renowned Museum exhibitions and Rose Center for Earth and Space. Visit AMNH before it opens to the public- an awesome experience! See New York's iconic American Museum of Natural History without the crowds! You will meet your dedicated guide before opening hours for your small group 75-minute VIP tour. Prepare to be wowed by the biggest and best collections that can only be found at AMNH including the largest dinosaur ever discovered, the big blue whale and the 563 carat Star of India. Your guide will highlight the world renowned treasures throughout the museum. When your guided tour is complete, and the Museum opens to the public, journey into space with your tickets to the spectacular Hayden Planetarium Space Show.